Serving the greater Helena area and providing cloud services globally since 2013. We can diagnose and replace broken PC components and save you money. Don't buy a new computer without calling us first! We can speed up your machine with faster hardware and software, for as low as $50. Hot, slow, and loud? Your computer is probably clogged with dirt. We will carefully disassemble, clean each component, and rebuild it for you. Is your computer suddenly running slow? Have us check it for viruses, trojans, spyware, crypto miners, and other malware. We can set up your WiFi properly, with a strong password and security. Everyone hates printers. You don't need that kind of stress in your life. Hire us instead. Does your home or business have "dead spots" without strong WiFi? Let us bring those dead spots back to life. You can never be too safe online. Let us protect your home or small business network. Solutions ranging from document collaboration to email to time tracking, all for pennies a day. Don't lose your data tomorrow, get backups today before it's too late. We can build your small business an affordable custom solution to give you an edge against competition. Get affordable, enterprise-grade network firewalls and servers to protect your business from threats. We build apps and cloud services for a variety of needs. A cloud-based notetaking app with color coding, checklists, Markdown support, and more. An easy point of sale system that runs on any device. Make beautiful websites that look amazing every time, zero technical expertise required. A simple and reliable electronic time tracking system. Simple, open source CAPTCHA for websites. Inventory management and item tracking. Painless digital newsletter creation and mailing list management. Live phone polling for presentations and trivia. Use our online Apps from your phone or tablet. 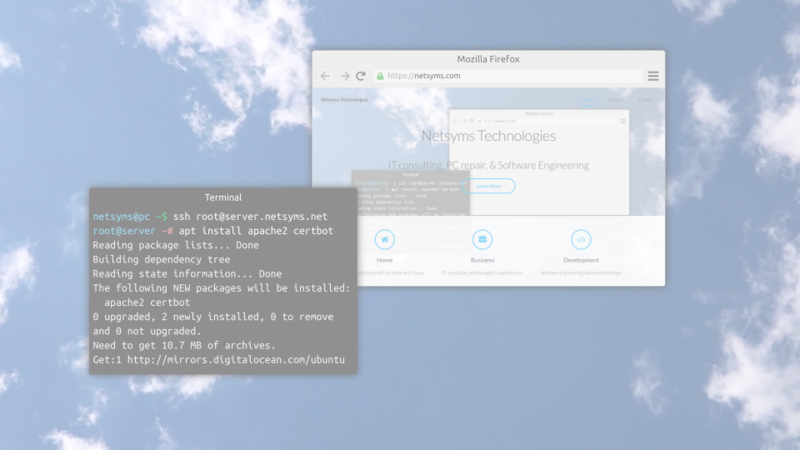 Here at Netsyms Technologies, we make extensive use of the Linux and open source ecosystem. To give back to the community and build trust, we release our in-house developed software under open source licenses.